If you ask me which one is my favourite Malabar snack, without any doubt I would have to say Unnakkaya. This special Malabar snack is more often during the iftar times. 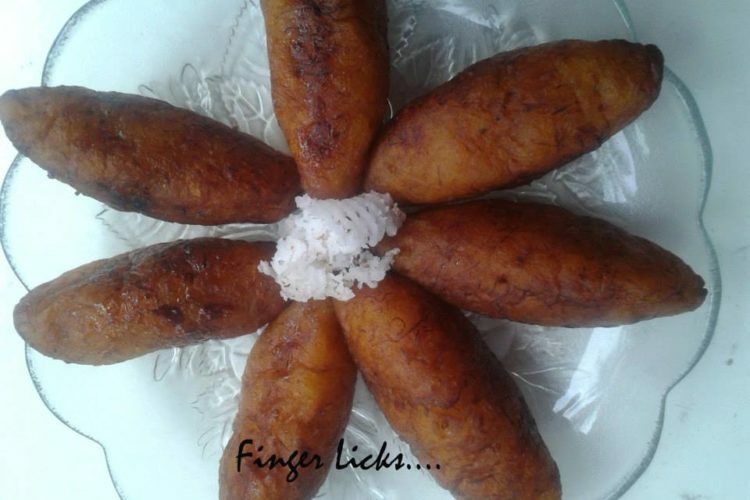 This is a famous appetiser in Malabar cuisine, which is made with plantain. Plantain(Nenthra Pazham) is the ripe large size banana easily available in all markets and it is much more common in Kerala. The mild crunchy on outside and softness of banana inside with a sweet coconut filling and some crunchy and sweet bites of cashew and raisins/ kismis makes this snack absolutely delicious. The main ingredient of this snack is steamed and mashed plantain. Which is rolled and flattened in to patties and these patties are stuffed with sweetened cardamom flavoured coconut, raisins and cashew nuts, and then rolled in to the shape of a spindle with oiled palm. The stuffed dough is then deep fried in to oil, preferably coconut oil for the extreme taste. I wish all my foodies should try this Unnakkaya at least once and I am sure that you can’t stop making it again and again. Cut the banana into two and steam it and remove the skin and the black seeds . Mash the banana into smooth dough without adding any water. keep aside. Mix the eggs with sugar and keep it aside. Heat 2 tspn of ghee in a pan, add the egg mixture and stir it well till it reaches scrambled egg consistency. Add the cashew nuts, grated coconut and kismis to it, sauté it fore few minutes. Remove from the fire and mix with cardamom powder. Apply little oil your palms and take small balls of the ground banana. Flatten it on your palm using your fingers into a small disc. Put 2 tspn of scrambled egg coconut mixture in it. fold the edges and press lightly. Now roll it with your hands, and shape it like rolls. Heat oil and deep fry Unnakkaya to golden brown and remove to a kitchen tissue and serve hot.